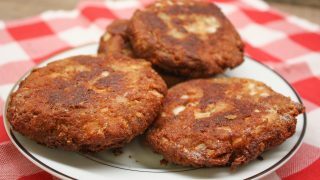 Southern Salmon Patties are an inexpensive meal and an easy recipe to make, so would you believe the recipe costs less than five dollars? Plus, it is quick to get on the table. This Deep South salmon patty recipe is made with breadcrumbs and fries up fast. 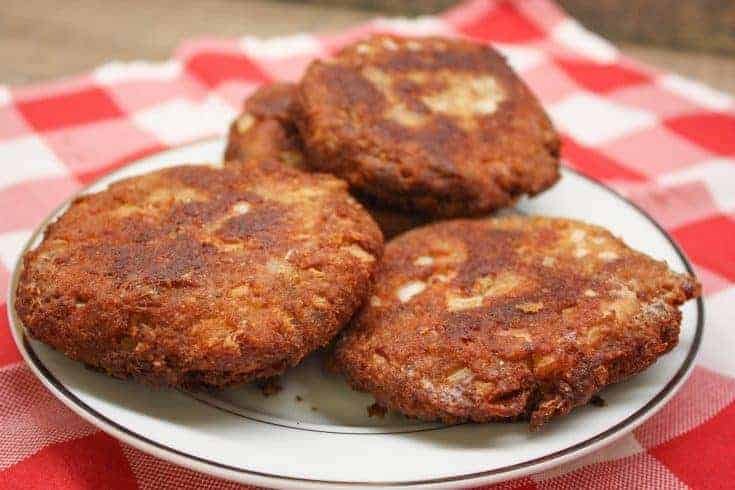 My mom loved salmon patties (also known as a salmon cake recipe) and as a matter of fact, I remember her cooking them quite a bit as a kid. She’d whip them up lickety-split and have them on the table ready to go. My husband requested Southern Salmon Patties the other night and I got a can of pink salmon from Aldi’s grocery store and got to work. Furthermore, I didn’t want to spend too much time in the kitchen, so I made this recipe as easy as possible. With the exception of the canned salmon, I had all of the ingredients here at the house, which helped make it a very inexpensive meal. Check for bones. But, you can also leave them in, if you’d like. They are soft. 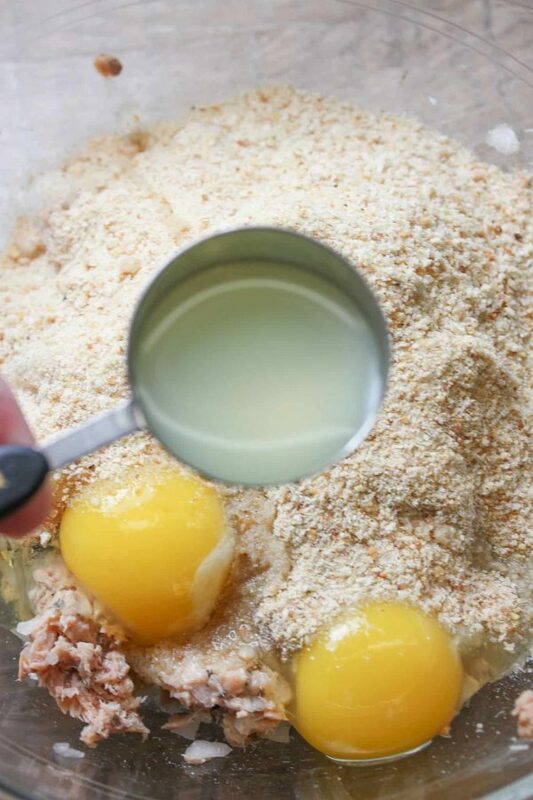 Add onion, breadcrumbs, eggs, lemon, and salt and pepper and mix together. Fry in vegetable oil for approximately five minutes on each side. Firstly, drain the juice off of the salmon can. I just used my hands and pressed against the salmon in the can as it drained off, so be sure to save the juice just in case the patties are a little dry after adding all of the ingredients. 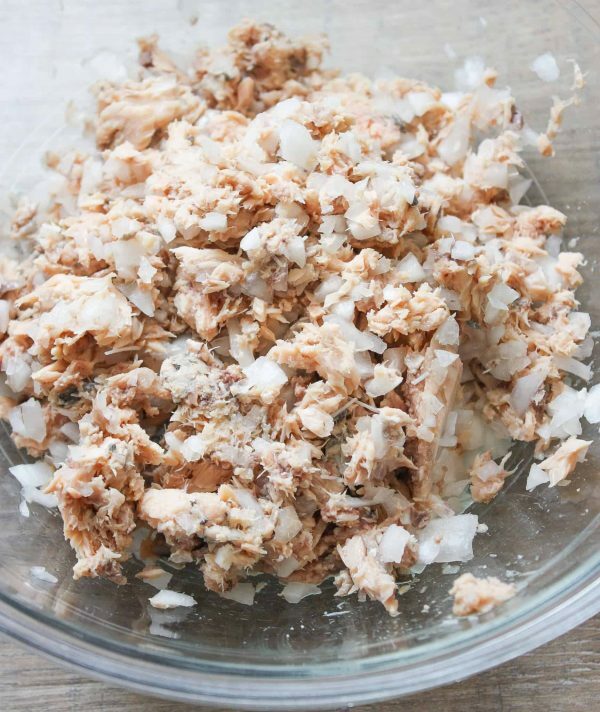 Add the can of pink salmon to a bowl. There shouldn’t be any bones, but I did find a few small ones. I sort of squished the salmon between my fingers to find anything hard and removed it. At this point, it’s going to be rare if you find any hard bones. They’ve been in the can so long that they will be soft–and it’s ok to leave them in. A friend of mine said she always picked out the bones and ate them when she was a little girl while her mom was preparing the meal. Secondly, add the chopped onions. I used my chopper for the onions. It’s a quick way to make them nice and small for the recipe. How do you make salmon patties stick together? Drain the liquid off of the can of pink salmon. 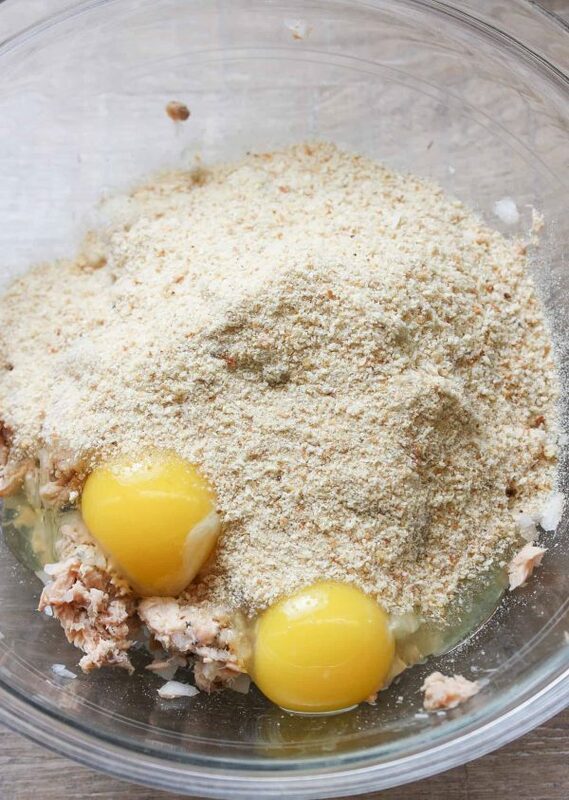 Add breadcrumbs, panko, or crushed Saltine crackers to the salmon, along with eggs. This will help the salmon patties stick together. 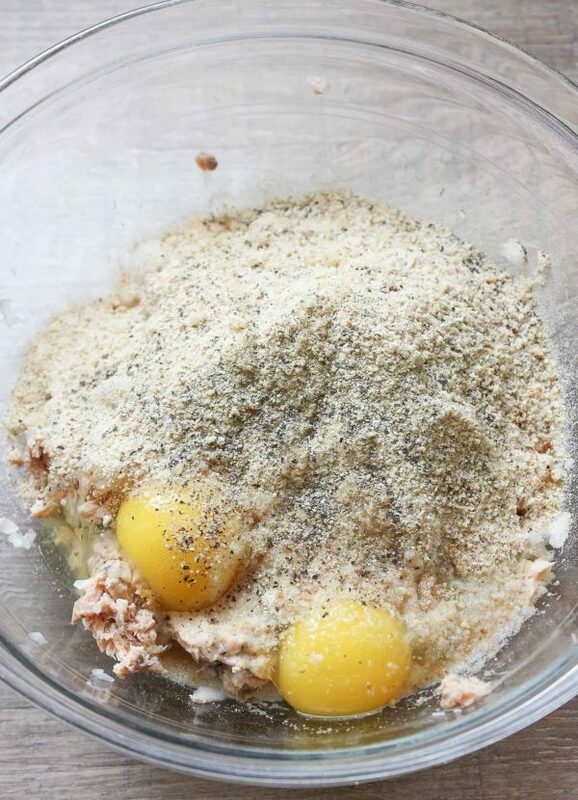 If the patties are too dry, add a little bit of salmon juice back into the mixture. 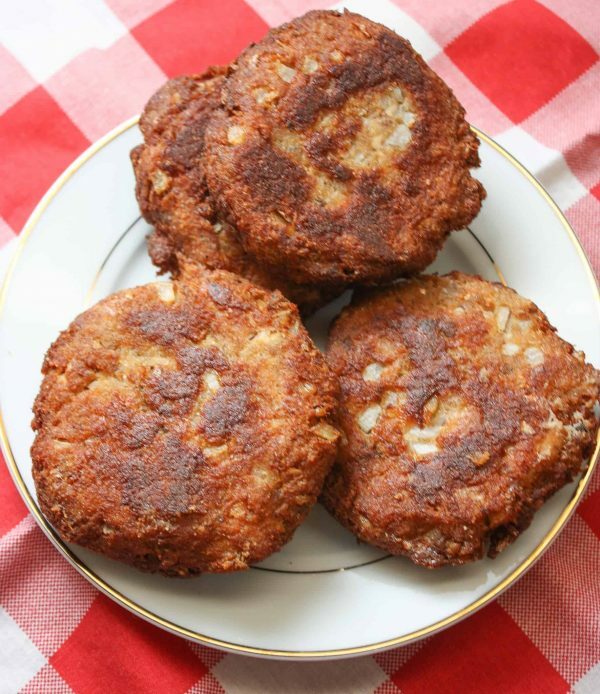 Shape the Southern Salmon Patties in your hands to fry or bake. 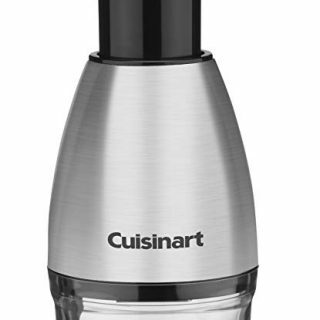 You can use breadcrumbs, crushed Saltine crackers, or panko breadcrumbs. Fifthly, add the lemon juice. Lemon juice helps get rid of some of the fish smell and adds a little flavor to the Southern salmon Patties recipe. We live near the beach and decided to go for a walk near the marina last night. When we parked and stepped out of the car we were hit with that fish smell. Somehow the beach smells a lot prettier (unless it’s red tide), but the marina, not so much. We need a big jar of lemon juice to pour in the marina – ha! The lemon juice won’t totally take away the smell, but it will help. Burning a candle after you eat will help, too. It’s not always easy to get the fish smell out of the kitchen afterward, but, these easy salmon patties are worth it. Finally, add the salt and pepper. Mix everything together well. I used my hands, so don’t be afraid to get your hands dirty with this recipe. Note: If they seem too dry, add a little of the salmon juice back into the mixture and reshape. Heat up some vegetable oil in a skillet. I filled the skillet up with enough oil that it would cover half of the patties. I made my fried salmon patties kind of thick. It yielded about six large patties. But, you can certainly make them smaller. My husband ate two patties and that was plenty. He ate one between two slices of bread and one without and loved it both ways. Tip: Add a side of mayo to the Southern Salmon Patties for some extra flavor. 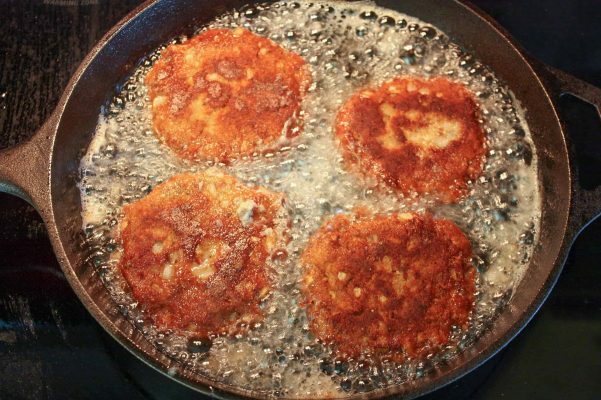 Fry the southern salmon patties until they are browned. Flip them over and fry the other side until they are browned. 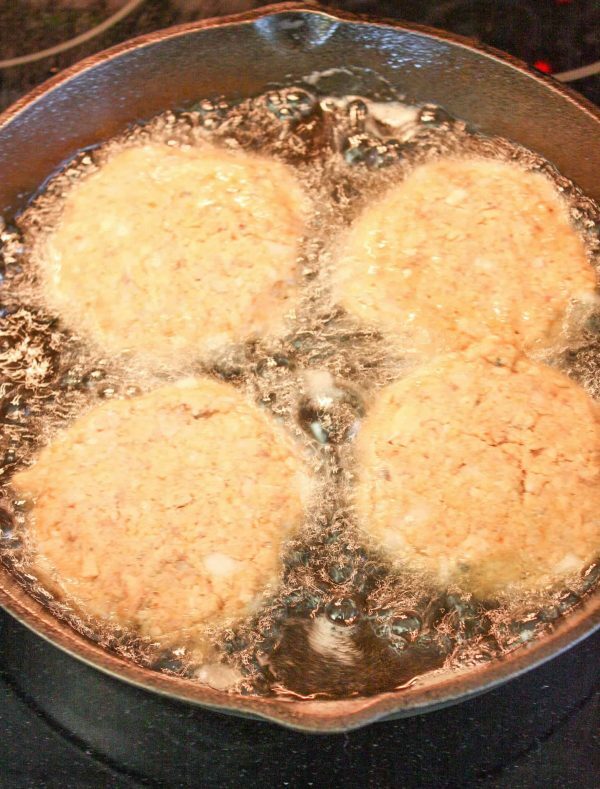 Once shaped, salmon patties generally take about ten minutes to fry. 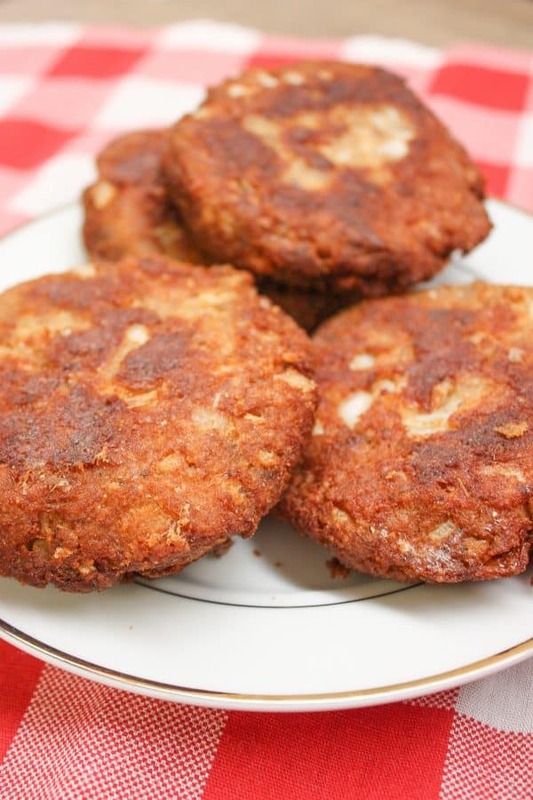 The patties can be fried for approximately five minutes on each side until the patties are browned. What do you eat with salmon patties? 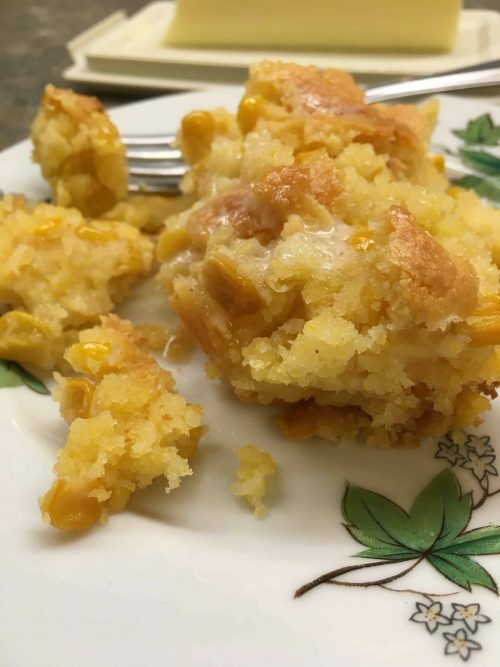 Add a side of moist Jiffy Cornbread to your table along with the Southern Salmon Patties, as well as some Crock Pot corn on the cob and oven baked potato wedges. 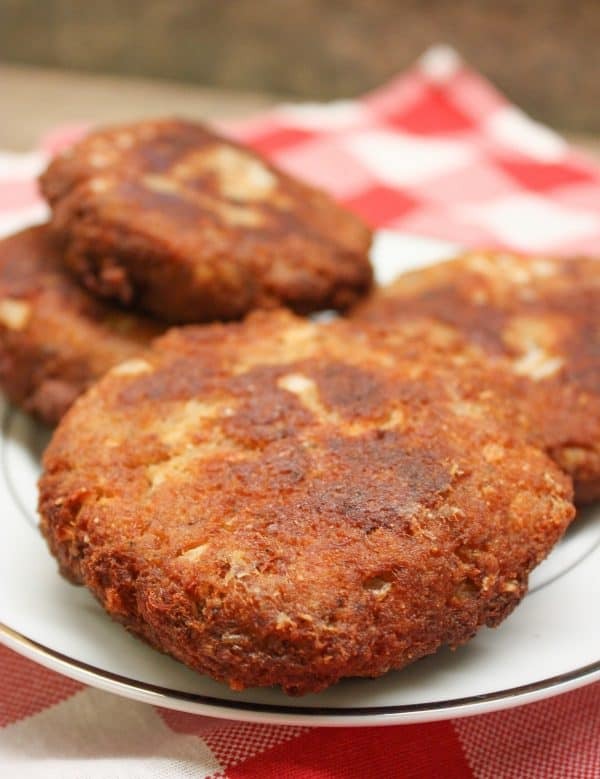 Southern Salmon Patties are an inexpensive meal and an easy recipe to make. The canned recipe costs less than five dollars and is quick to get on the table. This Deep South dish is made with breadcrumbs and fries up fast. Add vegetable oil to a skillet and preheat medium to medium-high. Add enough oil to cover half of the salmon patty. 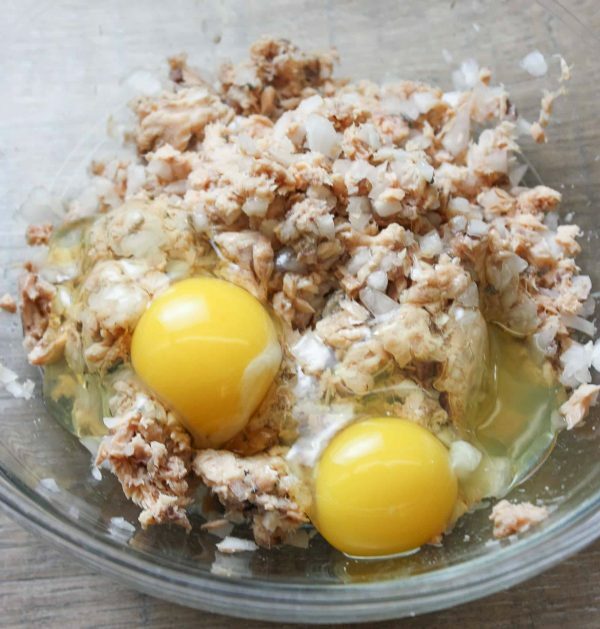 Add the chopped onions, eggs, breadcrumbs, lemon juice, and salt and pepper. Fry in vegetable oil for approximately five minutes on each side, or until each side is browned. Place on a paper towel to soak up the grease. It has been forever since I had Salmon patties. This recipe brought back some long lost memories. Thank you for sharing at Wonderful Wednesday. Hi Amy! I’m so glad they brought back memories. They are so fun. Thanks for stopping by! I can’t believe you make the same recipe of salmon cakes as my mom did. She hated taking the bones out, and there were always some hidden bones that were missed. Thank you for bringing back some special memories of her salmon cakes. I really enjoy the recipes you post, they’re down to earth. It”s so fun to discover those same recipes again! So glad to help bring back memories – that warms my heart, too. 🙂 Thanks for the sweet compliment!! My mom used to make salmon patties. The one big difference was that she told me the bones added calcium. You just squeeze the bones between your thumb and finger. They crumble easily. I was worried about chocking on a bone but never did. That is so true about the calcium. They are also good for getting collagen that we all need. I didn’t realize they would crush easily – very good to know. Mama used flour ,sometimes cornmeal.. I don’t use much oil for mine , I bet mama used bacon grease,,that’s what people did , I can’t stand the taste of it now . We always had sweet potatoes,Mac & cheese,green beans.. Sounds like a great meal! My grandma made everything in bacon grease, too. You’re right, it’s what people did. Thanks for stopping by and sharing your memory! Love how crunchy these guys look…the perfect crust!!! Hi Colleen! Thanks so much!! Have a good day. Thanks for the tip, Heather! Have a good night!! Your salmon patties look amazing! 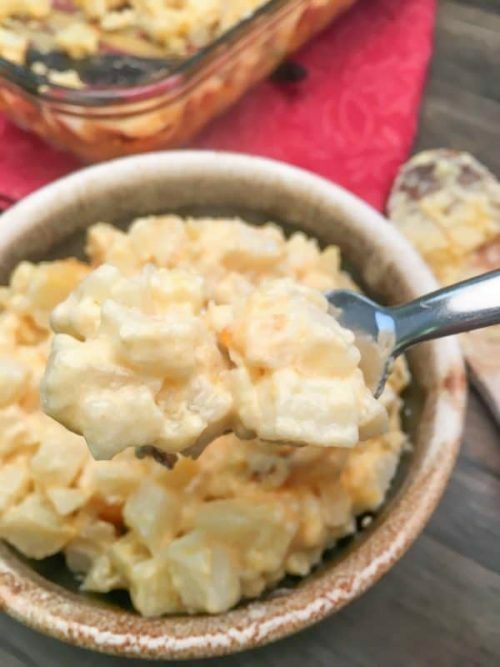 Thank you for sharing your recipe with us at Meal Plan Monday! Thanks so much!! And thank you to you all, too! My grandmother, who lived with us, made Salmon Patties for us kids just exactly like yours but without the Lemon Juice. So Delicious and really fairly healthy in trying to get us kids to eat “Real Food.” I now make these for myself but because I’m older with several health issues, I prepare them with a little more of the Salmon Juice from the can. They are a little “wetter” and more difficult to keep them in form. Cover a baking sheet with foil and spray with Non-Stick Spray. Bake in a 350 degree oven for about 5 minutes on each side. Then put them under Broil for 2 to 3 minutes on each side or until “Golden Brown.” They are almost as good but without all the oil! I really like yours much, much better!!!!!! Hi Major! Thanks so much for sharing the way you make your salmon patties. I will have to try it in the oven and with more of the salmon juice. Thanks for sharing your memories, too! Ha! My kids prefer ketchup, too! I think vinegar would taste good on them. We’ll have to try it next time. And hot buttered biscuits with salmon patties…oh yum! Bones are good for you, too! I make my salmon patties with instant potato flakes instead of bread crumbs, got the recipe off back of Crisco can many years ago, they are really good, plus add about 1/2 teaspoon dried dill weed when mixing them. That sounds really good. I love dill weed! Crisco has so many good recipes! I basically make salmon patties as your recipe but, with the addition of a bit of baking powder ! I know sounds weird but, makes the patties raise a bit and they are fluffier. It’s always great to hear how others make recipes. Thanks for sharing and I’ll have to try that sometime!